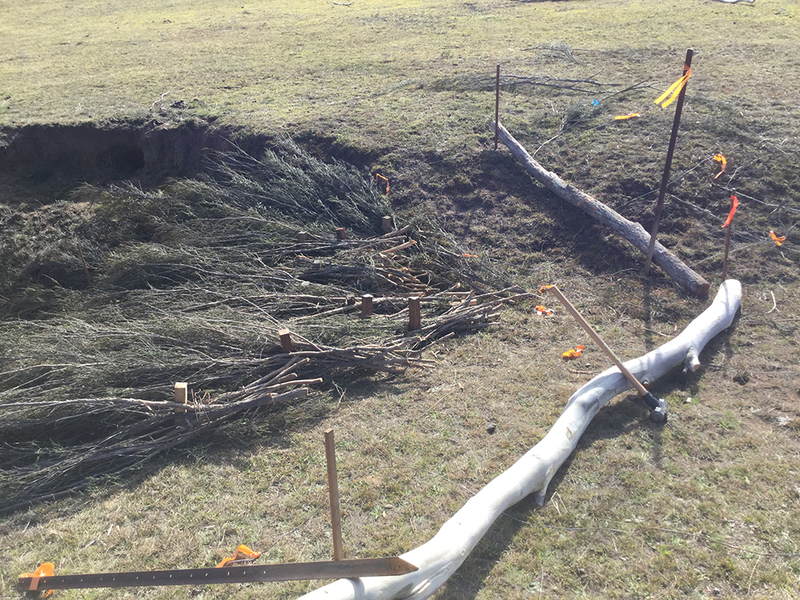 Green Army participants have been constructing a series of brush interventions to slow water flow through steeper sections of eroded valley floor at Mulloon Farm North. The structures are part of ongoing work that includes fencing off riparian areas, installing watering points and diverse native plantings. These all combine to help provide habitat for frogs, lizards and other critters, as well as capturing and processing organic debris entering from the woodland above. The work falls under the ‘SOS - Save our Scarlet Robin Project’ to enhance riparian condition, habitat and connectivity for a range of locally threatened species by providing niches and corridors. At Mulloon Farm North, the interventions will also complement and enhance remnant stands of snow gum, a spring-fed swampy meadow, terrestrial grasslands and diverse aquatic dam habitat. Funds for the SOS project are courtesy of a partnership between South East LLS and Mulloon Farm owners Gerry and Robyn Carrol, with the help of farm manager Nick Huggins. The Mulloon Institute is providing design and planning support and useful labour through our partnership with the Manpower Green Army teams. Mulloon Farm North is one of 20 properties taking part in the Mulloon Community Landscape Rehydration Project that aims to rebuild natural landscape function and resilience for the entire Mulloon Catchment. Brush mattressing is a useful technique for providing flow resistance and bed protection in narrower, vulnerable sections of flow line. To construct, lay material with branches down and butts upstream. Start laying at the base of the section you’re working on and move upstream, overlapping materials like roof tiles. Branch butts can be twitched together and initially secured to the bed with a few stakes. In time, accumulated sediment will help hold the materials in place, as will the enhanced vegetation growth resulting from grazing protection provided by the brush. Ensure that brush extends up the sidewalls with a U-shaped profile when looking along the channel. Otherwise, you run the risk of flow concentrating down the side of your material and eroding the sidewalls. Brush mattressing - In this case, placement was determined by the presence of a steeper channel section with bare soil and minor rills present, which threatened to form into a more significant headcut. Another section of brush mattressing on the left, with logs placed in a 'vee' in preparation for the construction of a log and brush weir above. A series of log and brush weirs designed to provide grade control through a steeper section of valley floor. Vegetation resulting from planned plantings and ongoing grazing management will help continue the step building processes kicked off by these structures into the long term. The team have also placed log piles at regular intervals along the riparian corridor, in particular near existing dams. Research shows that the presence of woody debris can enhance habitat for frogs, lizards, birds, soil organisms and even some plants. While the incorporation of short lived acacias in the planting mix will provide this material in time, a little bit of extra effort by the team has increased the short term presence of this important niche within the system.